I am back in Sydney, after a few weeks travelling around Japan and Italy! Hopefully you have followed my adventures on Facebook, Twitter and Instagram! I had an amazing time, visiting beautiful places, meeting family and friends and tasting awesome food! I will be sharing some of these adventures and photos in the next few days, so stay tuned! 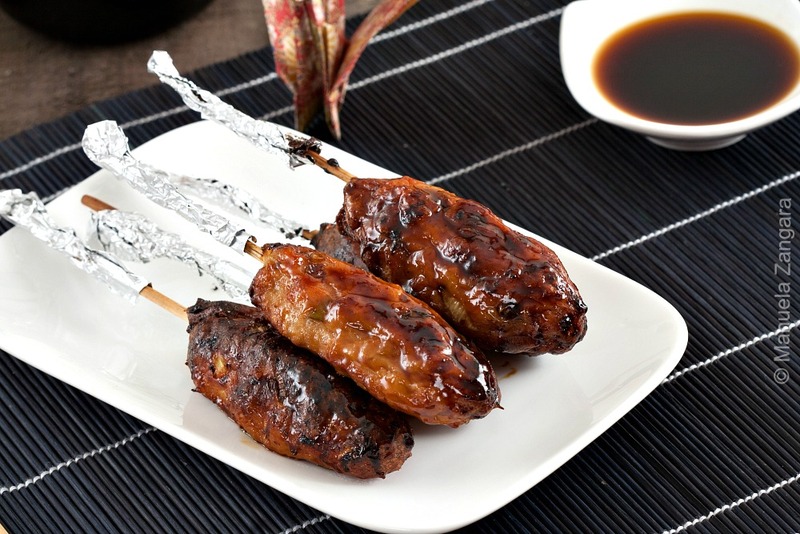 Tsukune – つくね are Japanese chicken meatballs that are skewered and typically grilled over charcoal. They are often served in yakitori restaurants in Japan and I had a fair share of these delicious bites during my recent visit to Japan. So… I had to make them at home, like all the things I discover during my travels and I fall in love with. 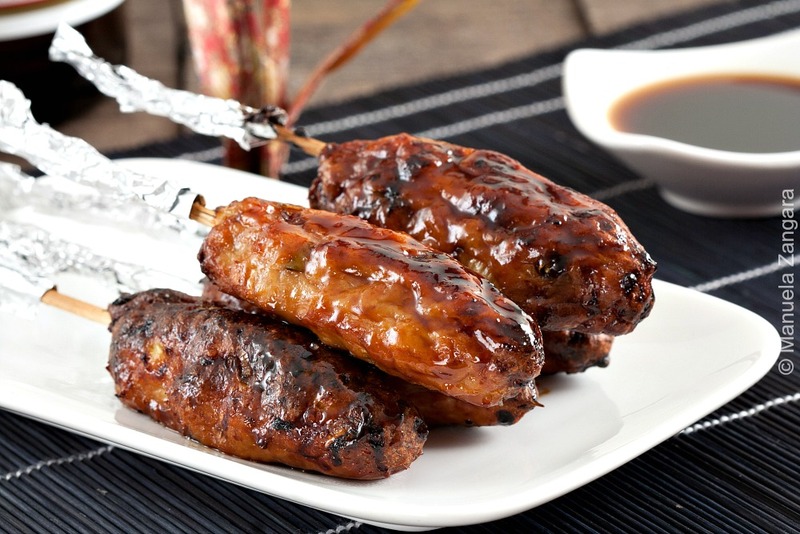 Tsukune is usually seasoned with salt or sweet soy sauce, called yakitori “tare”, that gets caramelized and charred over the grill, while the chicken remains moist… yum!!! I got this amazing recipe from Just One Cookbook. My friend Nami, who is Japanese, gives a great tip about keeping the meat from falling from the skewers without having to use panko or eggs. She says that the trick is to knead the chicken mixture until it becomes pale and sticky! That’s it. And it works! 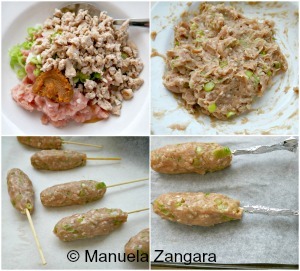 Another great tip to get moist and juicy chicken meatballs is to precook some of the chicken mince, let it cool and then mix it in with the raw chicken mince, instead of making the meatballs from all raw chicken. This prevents the meat from shrinking too much and from losing moistness. 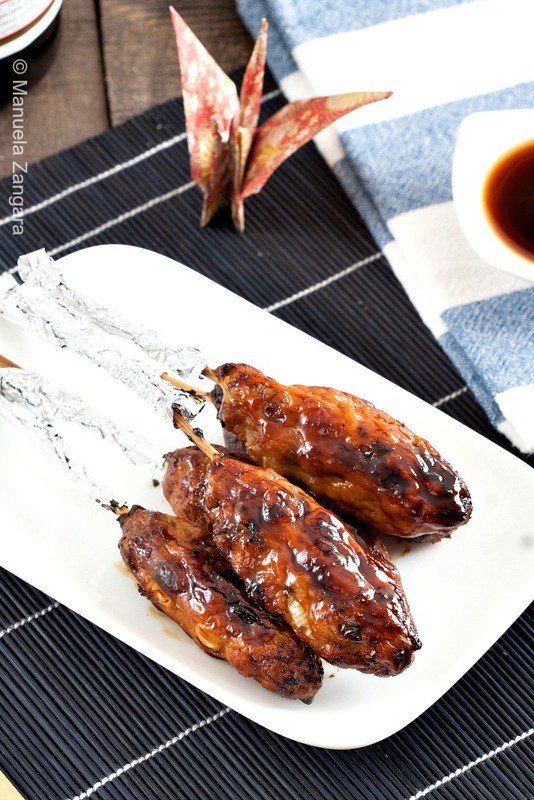 Serve them at your next barbecue party, I am sure they’ll be a success! Tsukune - Japanese chicken meatballs, skewered and typically grilled over charcoal. Thinly slice the shiso leaves, if you are usinge them, and the green onion. Heat a non-stick frying pan over medium heat. When it’s hot, add ⅓ of the ground chicken and break it up into small pieces with a wooden spoon. Cook until no longer pink and transfer it to a plate to cool down. Combine the cooked chicken and the uncooked chicken in a large bowl and mix well. Add the sesame oil and miso and mix well. Add the green onion and shiso leaves and mix well. Now with your hand, knead 30 times clockwise. Then knead counterclockwise 30 times. The meat will become more pale in color and sticky. This part is very important for the meat to stay on the skewer, so please do not skip this step. Grease the grill rack with a brush. Lightly coat your hands with sesame oil to prevent the meat from sticking. Scoop a handful of the chicken mixture and form it into a round patty. Toss the meat from left to right to release the air pockets and gently squeeze to form the meat into a long oval patty, about 8-9 cm – 3-4 inches in length. Put the skewer on the prepared wire rack. 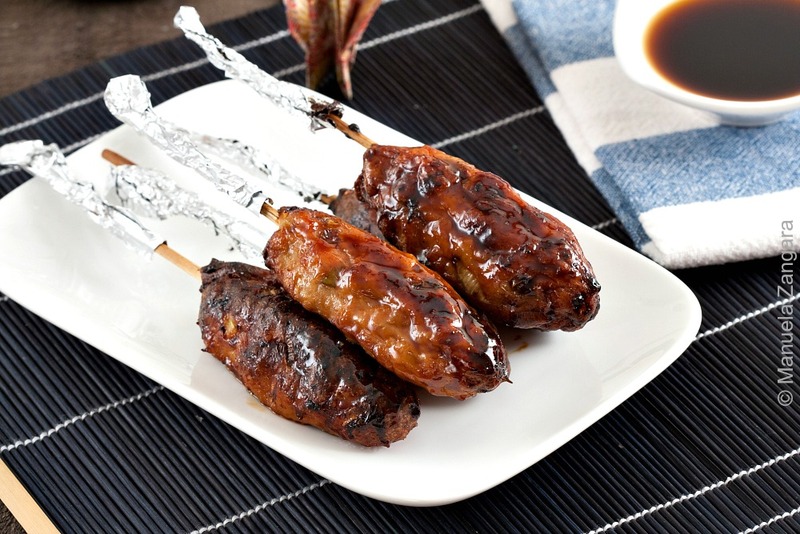 Put some aluminum foil on the skewers to prevent them from burning. Set the broiler to high and wait until the heating elements are hot. Broil in the middle rack for 6 minutes. Then flip the skewers over and broil for another 4 minutes. When both sides are cooked, brush the yakitori sauce on the meat and broil for another 30 seconds. Transfer the skewers to a serving plate and brush the extra sauce on the meat. Serve with Shichimi Togarashi (optional).